Prime Minister, David Cameron, has backed off presenting a vote in the House of Commons on military action in Syria in face of clear opposition from the Labour party. With some sceptical of the value of military action on his own side, he would likely lose such a vote. But the Foreign Affairs Committee has also warned that any benefits of air strikes in Syria would be more than outweighed by the risks of "legal ambiguity, political chaos on the ground, military irrelevance, and diplomatic costs". The Committee concludes that 1) while intervention would be welcomed by the UK's military allies, in particular the USA which is now putting in boots on the ground in a limited capacity, it would be likely to have only a "marginal effect" on the conflict. 2) The UK risks "further reputational" damage unless it can make a clear legal case for action, with a UN mandate the clearest basis. 3) It is unclear what the outcome would be and it is "hard to predict" the consequences of tackling IS alone, and who might take their territory if they are defeated. There is an unpalatable conclusion we can come to. Military engagement by the UK would make a marginal difference if any, but unless there is a clear target it would be as likely to perpetuate rather than end the conflict. Putin's goal is simpler: taking military action to support Assad. In that sense, the precise enemy 'target' is definable - any group against Assad. This has the merit of combating ISIS but by also targeting any rebel threat to Assad remaining in power. The US and its allies are unwilling to bite on that unpalatable truth. If you want to defeat ISIS you might have to support Assad. It is a devil and the deep blue sea type of choice. If military action perpetuates the conflict, then that too comes at a dreadful price. Perhaps it is time the UK dropped its aim of removing Assad as a requirement for a settlement. Explosive weapons such as bombs and missiles, are the most lethal on women and children. 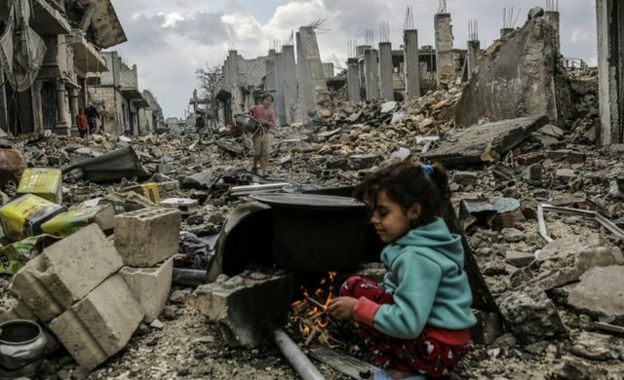 The study is the first to analyse the impact of different weapons on civilians and indicates that using explosive weapons in populated areas in Syria “has disproportionate lethal effects on women and children and should be urgently prohibited.” Prohibition, however, is difficult without the means to enforce it in a bitter and increasingly violent war. A report commissioned by the United Nations found that from March 2011 to April 2014 there were almost 200,000 verifiable violent deaths of individuals, including both combatants and civilians. The study led by Debarati Guha-Sapir at the Université Catholique de Louvain in Belgium, examined 78,769 civilian violent deaths that occurred in Syria from March 2011 to January 2015 for associations between weapon types and demographic groups. Of this total, 77,646 deaths were in non-state armed group (NSAG) controlled areas and 1,123 were in government controlled areas. The majority of deaths were men, but the finding shows that nearly 25% of Syrian civilians killed were women and children. The results show that children are more likely to be fatal victims of air bombardments, shells, and ground level explosives than men or women. In government held areas, child deaths were 5 times as likely to be due to ground level explosives, such as car bombs than deaths among men. Women were the second most likely to die due to explosive weapons, while the likelihood of death for men was higher for shootings and executions. They argue that air attacks and explosive weapons in populated areas “should be prohibited or systematically monitored to demonstrate civilian protection.” Furthermore, the evidence that child deaths from air bombardments, shells, and ground level explosives were equal or higher than those caused by chemical weapons, should prompt equal international condemnation and control, they add. “Our study shows that civilians become the main target of weapons and bear a disproportionate share of the burden of bombings. If we are looking for root causes of the migrant and refugee crises in Europe today, this is surely a major contributor,” conclude the authors. It also underlines the urgency of growing moves to ban the use of such indiscriminate weapons in populated areas. But again begs the question of how this would be imposed. So we are left wringing our hands. Postscript: Mr Cameron is pressing hard for a vote in parliament to approve UK engagement in the bombing of ISIL in Syria, extendng the military engagement in Iraq across the border. The Labour party is split on the issue. But what is needed is a proper military engagement with troops under UN mandate to remove ISIL and protect the civilian population. With bombing alone the outcome is uncertain. The House of Commons Foreign Affairs Committee has put a series of questions which need to be answered by the government before military action is approved. The Labour shadow cabinet should call on Cameron to make clear how military engagement would be made to remove ISIL and protect civilians. Any engagement should be under UN auspices and mandate on the ground.